band directors or parents of oboe students, that is! This website is designed with the "oboe-challenged" in mind. Hopefully you will find some helpful hints and resources. Just in case you're wondering...... My name is Amy Sandlin, and I have been teaching middle school band for 17 years and private oboe lessons for 19 years. 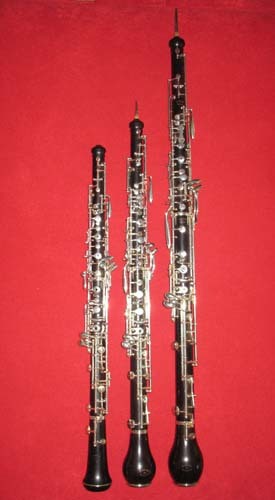 I graduated with Bachelor's and Master's Degrees in Music Education from East Carolina University, and my major instruments were (and still are) Oboe and English Horn. I also achieved Certification from the National Board for Professional Teaching Standards. Not very common -- mostly used in Baroque music. Bach used it quite frequently. More common than oboe d'Amore, less common than oboe. Used frequently in bands and symphonic orchestras as a solo instrument.